If you’re going to emulate a mama’s boy, there was no one better than Pop. 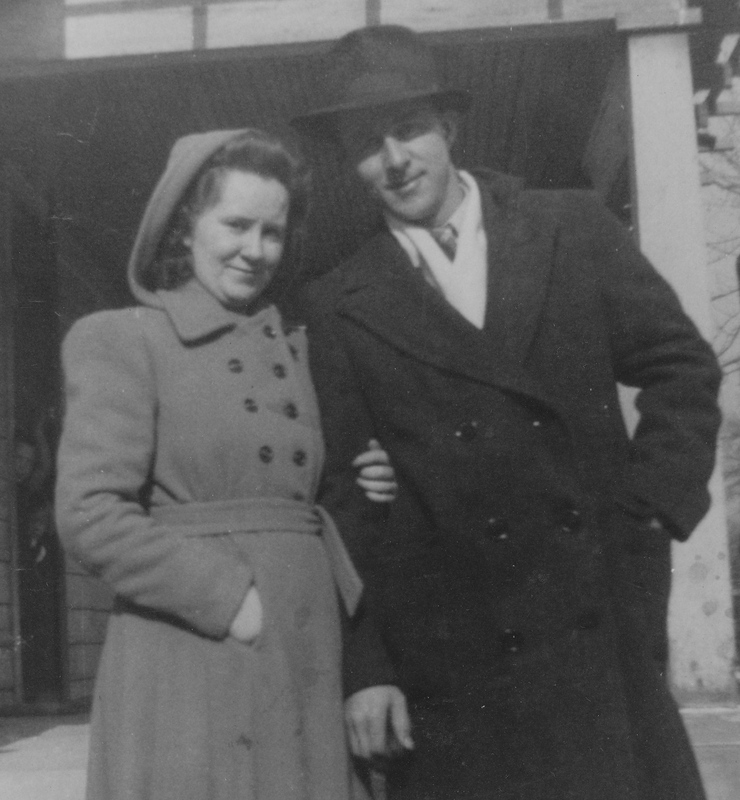 Dad adored his mother, Hazel Marie Hoffert Maupin. And, if I had to choose between grandmothers, she was my favorite, too. My choice probably comes down to temperament. Where Grandma Adams always seemed a tad tightly wound—with an Irish terseness that bordered on neurotic—Grandma Maupin was the polar opposite: calm, pleasant and thoughtful. She introduced me to books and reading—Agatha Christie mysteries were her favorite pastime. One birthday she bought me a copy of Alfred Hitchcock mystery stories, which I treasured no end. Whenever she paid us a visit, she took time to inspect my bedroom bookshelf. I loved Grandma Maupin. And, like my father, I was desperately sad when she died the evening of Nov. 19, 1977. I was told of Grandma Hazel’s passing when I came home from a Saturday shift at the mall, around 8:00 at night. Dad snapped into action and had us on a flight to Indianapolis at 3 p.m. the following day, leaving in a late autumn snowstorm and landing in Indiana to warmth and rain. Now, rereading the diaries, it’s abundantly clear to me why we vacationed to Indiana the summer of 1977. Dad knew he was losing his mother back in mid-April, when we learned about the colon cancer diagnosis, and he flew to Indianapolis to be with her. And Mom’s irritation with me during the vacation and that autumn in school now makes sense: they were preparing to mourn the loss of the first parent of that generation. The seriousness of the matter was one The Family Project had never confronted before. I was not yet 18, so I thought only about those things teenagers think about: themselves. 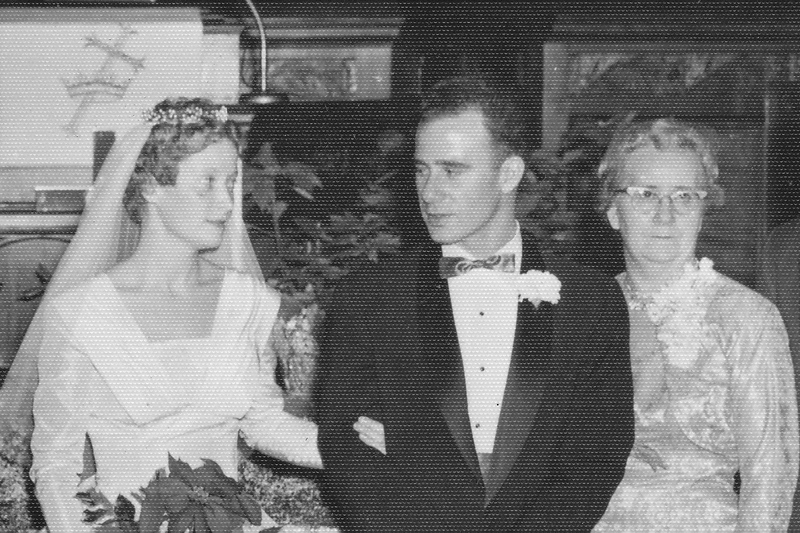 Now it’s time to remember Hazel, Paul Edgar Maupin’s first and only wife, born in 1909, and to whom he married in the late 1920s (on their wedding day, at left). My father, Paul Junior, their firstborn, came along in 1932. She came from hearty German stock, the fourth child of John Wesley Hoffert (born 1883, died in 1955) and Dora Ethel Jenkins (known to me and baby brother as “Maukie,” born 1888 and passed away just after we’d moved to Minnesota, in 1971). 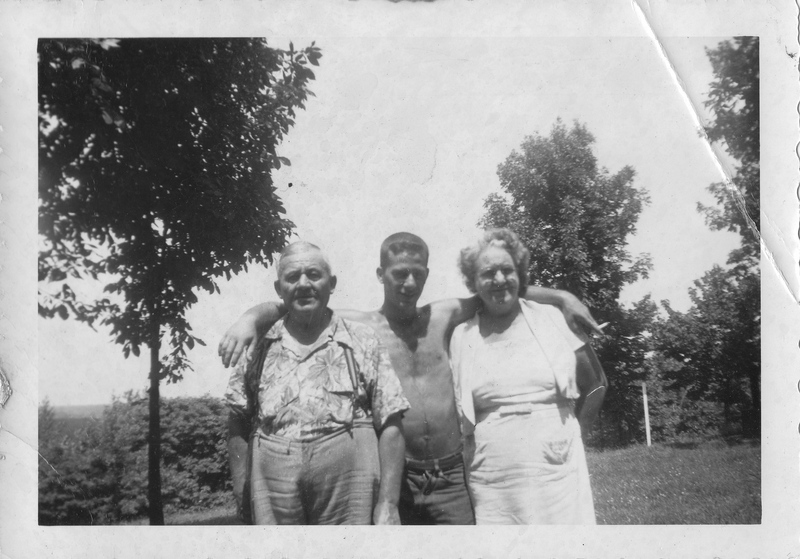 All I remember about Great-grandma Maukie was her easy laugh and liverspotted arms. That, and an odd stain on her living room ceiling, which fascinated me as a child. With her came a slew of great aunts and uncles: Uncle Orville, Aunt Charlotte, Aunt Vivian, Great Uncle Walt, who I believe was actually Grandpa’s older brother. 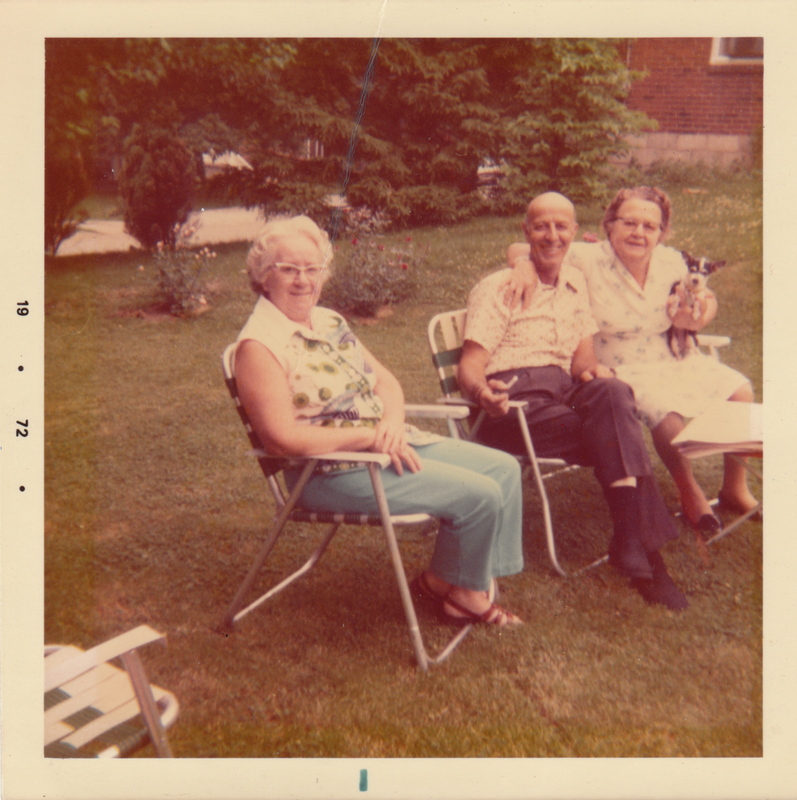 It was a big, bustling family, and Dad (pictured below right with his grandparents, John and Dora “Maukie” Hoffert) felt right at home among them. We stayed with Grandpa Maupin for nearly five days, as the funeral took place the afternoon of Tuesday, Nov. 22, with me and Brian as pallbearers along with our Uncle Gordon and great uncles Orville and Walt. I was thinking of my friends back home, and not doing much ruminating about Grandma, which doesn’t surprise me. Dad, I faintly recall, was broken up. Grandma was his rock, the emotional core of his family. As the funeral procession drove back through Indianapolis, I stared out the backseat window of the funeral director’s Cadillac, watching blankly as the houses of Indianapolis’ inner ring suburbs flicked by. That ride, the diary states, seemed to take a very long time. ~ by completelyinthedark on August 10, 2012. Another great entry Sir Michael! I seem to recall you going to “your granmdmas” funeral. This was a wonderful homage. My first encoutner with the passing of this generation was to occur in 1980 (Grandma Greene).